Baja Designs was the first company to develop a forward projecting LED light bar which was introduced and raced in the 2005 Baja 1000. Baja Designs LED Lights continues to engineer revolutionary ways to stay at the forefront of motorcycle and automotive LED lights. Get the best 5000K daylight-color auxiliary light available. The original LED light bar has evolved into a line of the highest performing and race winning LED lights on the market. 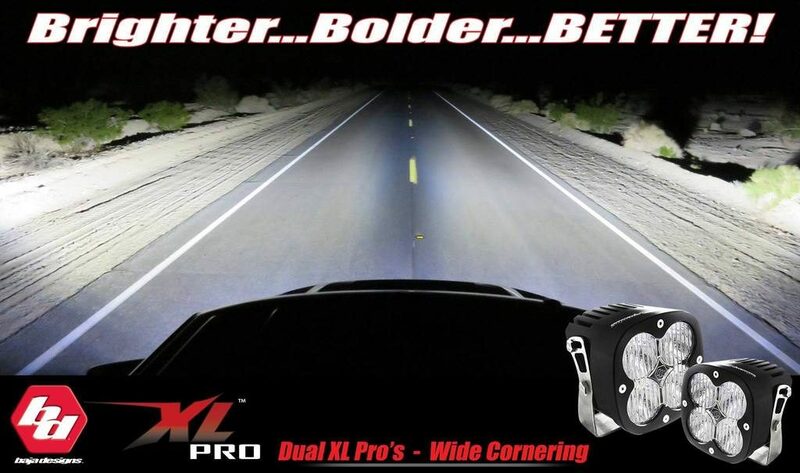 Baja Designs LED light bars have been at the forefront of off-road lighting for over 20 years. Their line of high performance LED light bars and LED lights offer the highest quality CREE LEDs currently available and are combined with the finest optics and heavy duty durability. Looking for more than just off-road LED lights bars. Then Total Automotive Performance has you covered. Baja Designs LED auxiliary lights provide your Car, Truck, SUV, or Jeep with one of the most energy-efficient lighting solutions on the market today. Baja Designs LED auxiliary lights are known for their versatility. Baja LED’s emit their light in a specific direction, which reduces the need for reflectors and diffusers that typically trap light. These bulbs also produce very little heat in comparison to standard bulbs. Using Baja Designs LED lights for your vehicle will give you an ultra-bright, long-lasting lighting solution. Each auxiliary light is designed with high-performing LEDs encased in powder-coated cast aluminum housings for durability in the toughest environments. Keep in mind, that Baja Designs lights are designed to fit all types of vehicles with specific and universal mounts. Auxiliary LED lights can be installed on any Truck or Jeep, all brands of cars and SUV’s, ATVs, UTVs, motorcycles, and more. One of the best things about Baja LEd Lights is that they create a smooth spread of usable light in several distinct zones. You can choose high speed spot reflector and racer edition for long-distances which illuminate miles of road, or try a wide cornering beam pattern eliminating “tunnel vision” that can add to driver fatigue and diminish safety. Total Automotive Performance also offers a standard driving pattern, and a flood pattern which is ideal for illuminating a work area.